Including a celebrity in an advertising campaign used to be considered a tried and true recipe for success. History is rife with memorable print ads and television commercials featuring prominent public figures. But the perception that entertainers automatically increase sales has always been controversial to say the least. Getting an actor or musician to deliver an endorsement usually costs millions of dollars, far more than a typical creative. The rise of the digital domain has also changed the way consumers respond to marketing, and some feel that today’s viewers are too sophisticated to fall for the same old tricks. The viability of paid tweets may usher in the death of personality-driven promotions, and a new Ace Metrix study confirms everyone’s worst fears about this antiquated model. Ace Metrix examined over 2,000 celebrity ads over the course of a year to determine their effect on consumer behavior and gauge their overall popularity. They discovered that while a handful of campaigns produced positive results, the vast majority simply were not worth the substantial financial investment they required. Overall, non-celebrity ads outperformed those with celebrities in every measured category, including likability, persuasion, desire, and even watchability. The last classification is somewhat surprising given the circumstances. Many celebrity ads are designed to be entertaining rather than informative and often concentrate on the laugh factor. There are several valid explanations for the findings and Ace Metrix reveals the key points in their data analysis. First off, celebrities tend to be polarizing figures. Anyone that garners a lot of media attention is bound to provoke a strong reaction in the audience; however, that emotional response may be negative, which alters the individual’s perception of the product or brand. Ace uses Tiger Woods as a case study because of the turmoil in his personal life. All that bad press hurt his standing in the public’s eye, which ended up harming his main sponsor, Nike, by association. In essence, hiring a celebrity is a risky move because it can help or hurt your company simultaneously. Ace identifies another decisive facet: relevance. Consumers don’t like being confused, so writers have to establish some kind of clear connection between the product and the person supporting it. Otherwise, the message comes across as disingenuous at best. For example, Dr. Dre appeared in an ad for an HP laptop that he helped engineer. The ad conveyed the relationship between the rapper and the computer, which gave it the necessary credible context. On the other hand, Lance Armstrong’s Radioshack ad failed to solidify the relationship between the two entities. In fact, the ad didn’t mention the brand name or show any related images. Consequently, the campaign earned poor reviews for its puzzling content. It’s sometimes said that celebrities are used as a substitute for imagination in marketing. This study illustrates the truth behind the old adage. Putting time and effort into generating good copy pays off in the long run, so avoid the temptation to simply toss a supermodel into the mix. Three Cheers For Mobile In-Game Marketing! Mobile marketing is quickly becoming one of the most popular arenas in the online advertising industry. As the number of Smartphone users rises on a daily basis, marketers search for creative ways to engage this tech savvy crowd. Mobile gaming application platforms present such an opportunity. Games are dominating mobile app purchases; it seems as though consumers are more interested in entertainment than practical services i.e. GPS. But companies are finding that the majority of mobile users are open to certain types of in-game display ads, provided they have an incentive attached. For example, Angry Birds is a fun and addicting game that was originally designed for the iPhone in 2009. Its rousing success prompted the developers at Rovio to move into the Android and Symbian markets in 2010. The company decided to change things a bit by offering users a chance to download a version of the game that includes ads for free or pay for an ad-free alternative. Since then, consumers have shown a marked preference for the former edition; people downloaded the two at a rate of 11 million to 7 million, respectively. 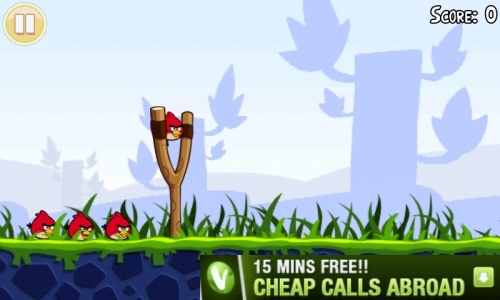 Rovio reportedly earns approximately 1 million dollars a month in ad revenue alone! The game has taken on a life of its own thanks to an innovative marketing technique. Fans can purchase plush toys of their favorite characters, and there’s a board game as well as a feature film in the works. While most of the company’s profits still stem from paid downloads, the Angry Birds model proves that in-game marketing holds tons of potential. Juniper research predicts that in-game advertising spending will continue to rise and spur job growth in the process. If their projections hold true, then income earned off of ad revenues will exceed that of paid downloads by 2013. This is great news considering the fall out of in-game ads in the video game world. One of the largest gaming companies, EA, tried incorporating ads into some of their products, but eventually decided to nix the idea at the end of 2010. EA claims that the venture did not live up to RIO expectations, so they abandoned the project entirely. However, it’s worth noting that these types of campaigns are conducted primarily for branding purposes. Branding is an abstract concept, which makes it hard to precisely quantify the impact of associated ads. Demographics should also be considered part of the equation. Most of EA’s games are geared towards young men whereas Angry Birds has universal appeal. These are some of the relevant facts to consider when determining whether or not this kind of investment will be worthwhile. Hopefully the folks at EA will reconsider once they read the Juniper study. The Key to Twitter Marketing: Sponsored Tweets? Marketers fully embraced Twitter some time last year, but the platform’s utility is continuously evolving. Twitter allows advertisers to interact with consumers without any of the barriers associated with Facebook, so it’s no surprise that social media experts are concentrating on the former at the expense of the later. Small business owners find Twitter simplifies the process of engaging with customers, while larger companies aim for more generalized branding campaigns. Research demonstrates the connection between word of mouth buzz and successful branding, although some are hoping to generate the same effect via artificial means. Perhaps the most novel approach comes in the form of celebrity sponsored tweets. Digital advertising is all about reaching the audience, and celebrities have thousands, if not millions, of Twitter followers. These groups of people may or may not follow a certain demographic pattern. For example, it’s probably a safe bet that the majority of Kim Kardashian’s followers are young women. This information gives marketers the opportunity to craft tailored ads that might appeal to the majority of her fan base. Some of her affiliates include clothing retailers Charlotte Russe and Rebecca Bonbon; both of them offer products designed for teenage girls and twentysomethings. Kardashian reportedly makes roughly $10,000 for every sponsored tweet, so this avenue is definitely lucrative for the participating celeb as well as the agencies that match up advertisers with endorsees. The FTC requires some form of identification to set the sponsored listings apart from the organic microblogs. This is easy enough to accomplish, though it seems to defeat the purpose of the campaign. Many of the companies that connect celebs with brands in need give the stars permission to accept or reject the products that appear on their timelines. Nevertheless, seeing the word “ad” underneath a glowing piece of product placement might come across as disingenuous to the point of being ignored. For example, does anyone really believe that Jenny McCarthy regularly eats at Arby’s? What’s worse is that often times, the paid tweets aren’t even written by the entertainers themselves. Instead, they’re written by folks trying to sound like the person in question. This increases the cheesiness factor tenfold. The tweets don’t really stand out or disrupt the flow as a result, unless the person has a distinct way of typing that’s difficult to reproduce. Snoop Dogg is a prime example. His spelling and sentence structure are unique to the point where they can’t be replicated, especially not by someone that is unfamiliar with hip hop vernacular. Clearly, companies are banking on this strategy’s effectiveness. It’s almost impossible to measure such a campaign’s results, since the ad itself is so far removed from any kind of consumer action. Does anyone have confidence in paid tweets? Make believers out of us!